I’ve written before that “I’ve dreaded the day I’ll finally need to write a chapter or two on [Charles] Lindbergh’s response to the rise of Nazi Germany.” That concern came back to mind yesterday, when I visited the U.S. 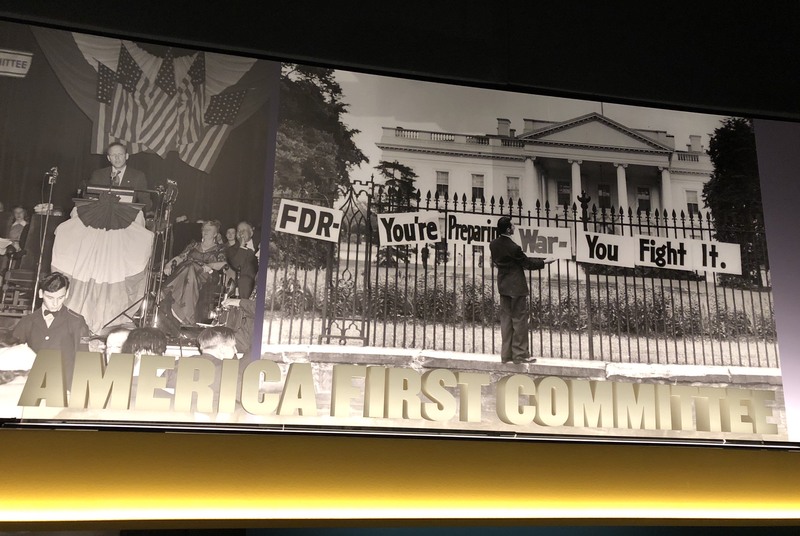 Holocaust Memorial Museum and went through the temporary exhibit on “Americans and the Holocaust.” About halfway through, there’s a section on the isolationist America First Committee, which got a boost when Lindbergh began to speak on its behalf. The America First Committee’s reputation changed significantly after Lindbergh accused Jews of being “war agitators” in a speech at Des Moines, Iowa, on September 11, 1941. Newspapers and magazines across the country denounced the committee and Lindbergh himself for promoting antisemitism and intolerance. America First Committee leaders denied the accusation, but the criticism continued and the organization’s influence diminished significantly. As soon as the United States entered World War II in December 1941, the committee disbanded. It was not the first time I had come across this speech but it was the first time I had heard it spoken in my father’s own voice. I was once again transfixed and horrified, again ablaze with shame and fury—‘Not you!’ I cried out silently to myself, and to him—‘No! You never said such things! You raised your children never to say, never even to think, such things—this must be somebody else talking. It can’t be you!’ I felt a global anguish—the horror of the Holocaust, the words of my own father ignoring the horror, but surely not condoning the horror, surely not dismissing, or diminishing it, surely not. But I also felt a piercingly personal rage, and if I could have written it down it would have looked like this: ‘How could you do this to Mother? How could you leave her with this? Just die, and leave her alone, to answer the charges this speech forever invites? Why didn’t you leave instructions, Father? Why didn’t you tell us what to do about these words you left behind, on tape, before I was born, with this reputation that does not fit my experience of you? Did you think it was enough to ignore the accusers, to say briefly, tight-lipped, “I’m not anti-Semitic!” and ask us with your own silence to do nothing at all, to say nothing at all, forever? Do you know how hard that is? Do you know what you have asked of us? Do you have any idea what it feels like to be someone who loved you, and is left with this? How could you have done this to us? How could you have done this to me?